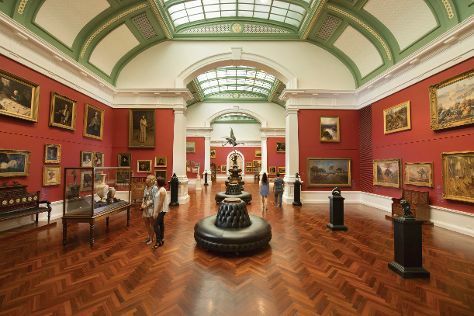 Start off your visit on the 15th (Mon): explore the world behind art at Art Gallery of South Australia, then take an in-depth tour of South Australian Museum, and then take an in-depth tour of State Library of South Australia. To find more things to do, traveler tips, other places to visit, and other tourist information, go to the Adelaide road trip app . Melbourne to Adelaide is an approximately 3.5-hour flight. You can also drive; or take a train. In April, daily temperatures in Adelaide can reach 26°C, while at night they dip to 14°C. On the 16th (Tue), you'll have the morning to explore before heading off to Kangaroo Island. To find other places to visit, maps, photos, and tourist information, you can read our Kangaroo Island trip planner . Traveling by flight from Adelaide to Kangaroo Island takes 2.5 hours. Alternatively, you can do a combination of car and ferry; or do a combination of bus, ferry, and taxi. On the 17th (Wed), you're off toHahndorf. To find traveler tips, more things to do, photos, and tourist information, read Adelaide trip builder app . You can fly from Kangaroo Island to Adelaide in 2.5 hours. Other options are to do a combination of car and ferry; or do a combination of taxi, ferry, and bus. On the 17th (Wed), you'll have the morning to explore before heading off to Hahndorf. Hahndorf is a small town in the Adelaide Hills region of South Australia. You've now added Hahndorf Academy Regional Arts & Heritage to your itinerary. On the 17th (Wed), examine the collection at Hahndorf Academy Regional Arts & Heritage. To find reviews, photos, traveler tips, and other tourist information, go to the Hahndorf online trip planner . Hahndorf is just a stone's throw from Adelaide. In April, daytime highs in Hahndorf are 26°C, while nighttime lows are 13°C. Finish up your sightseeing early on the 17th (Wed) so you can go by car to Adelaide. For photos, other places to visit, more things to do, and tourist information, read our Adelaide online trip maker . Adelaide is just a short distance from Hahndorf. You'll set off for Rowland Flat on the 18th (Thu). Rowland Flat is a small South Australian town in the Barossa Valley, located on the Barossa Valley Highway between Lyndoch and Tanunda. Your day-by-day itinerary now includes Torbreck Wines, Chateau Tanunda and Seppeltsfield. Kick off your visit on the 18th (Thu): learn about winemaking at Chateau Tanunda, learn about winemaking at Seppeltsfield, and then do a tasting at Torbreck Wines. For traveler tips, other places to visit, more things to do, and tourist information, go to the Rowland Flat travel itinerary planner. Drive from Adelaide to Rowland Flat in 1.5 hours. Expect a daytime high around 26°C in April, and nighttime lows around 13°C. You will have some time to spend on the 19th (Fri) before leaving for Adelaide. Your day-by-day itinerary now includes The University of Adelaide. Kick off your visit on the 19th (Fri): enjoy the scholastic atmosphere at The University of Adelaide. To find ratings, other places to visit, traveler tips, and more tourist information, you can read our Adelaide trip planner . You can drive from Rowland Flat to Adelaide in 1.5 hours. You'll set off for home on the 20th (Sat).